Empties & speedy reviews - the sheet mask edition featuring Estée Lauder, Tony Moly, Sarah Chapman & more! Sheet masks have been having their moment for quite a while but I didn't particularly see the appeal until recently. You may have read that I had a nightmare with my skin and what I did to remedy that in my post here. Because I want my skin to be in its best condition, I have been using masks to keep it hydrated, plump and radiant and sheet masks have been a big feature. Today I want to give my thoughts on the ones I have used recently from Origins, Estée Lauder, Sarah Chapman and more and whether I would repurchase them. Origins "Flower Fusion Hydrating Rose" Sheet Mask: I love anything rose related so chose this when I was deciding which mask to buy from the Origins range. This mask was very saturated and after 10 minutes, my skin looked quite dewy, was hydrated and felt soft to touch. I massaged the excess essence into my skin and then completed my skincare regime. It isn't the cheapest of all of the masks here today at £5/€6, but it's a nice instant treat for the skin and I will probably repurchase at some point. 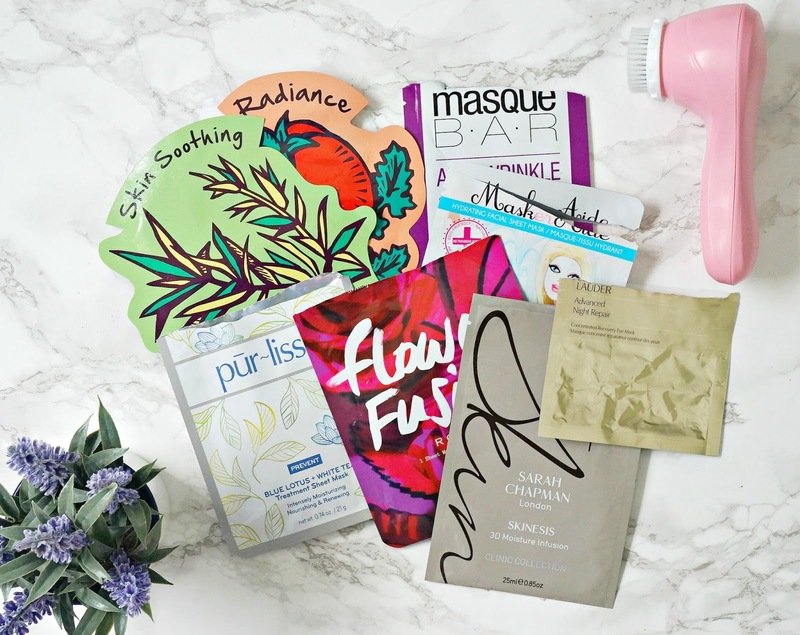 Sarah Chapman Skinesis 3D Moisture Infusion Mask: Hands down, my favourite of all of the sheet masks in this post! This mask is the most hydrating of all that I've tried, leaving my skin plump, extremely hydrated, firm, even, calm, bright and dewy - honestly, my skin looks 5 years younger when I use these masks. This is the last one in my box of four but I will repurchase at some point. The box of four is priced at £43, but I would highly recommend them to anybody over the age of 30 for a treat before a special occasion. Maskeraide "I Don't Wanna Grow Up" Mask: The name is ridiculous but this is a good hydrating mask, which left my skin feeling nourished and comfortable. Fine lines were diminished and my skin was soft to touch. There were no lasting effects but for an instant pick me up, it's worth trying! £5/€6.25. I may repurchase at some point. Tony Moly Tea Tree Soothing Sheet Mask: I bought this to try to reduce the inflammation I had after the reaction to a product but I was quite hesitant about trying it because it was quite strongly scented due to the inclusion of tea tree oil, although the scent did appear to dissipate after a few minutes. This did reduce some of the redness in my skin but overall, I wasn't overly impressed so I wouldn't be in a rush to repurchase as it left my skin feeling a little dry. £5. Tony Moly I'm Real Tomato Sheet Mask (Radiance): I loved this mask for an instant hit of radiance - I used it on a morning after a night of disturbed sleep so it was really put to the test! I liked how bright my skin looked after using it and I am definitely going to repurchase for future days when I look as tired as I feel! £1.95/€3. Pur-lisse Blue Lotus + White Tea Treatment Sheet Mask: This mask, although too small for my face, is a real treat. It quenches my dry skin's thirst and soothes my skin to leave it more comfortable and bright overall. I already have a back up! $36 for a box of 6. Read more on Pur-lisse here. Estée Lauder Advanced Night Repair Concentrated Recovery Eye Mask: We all know that Estée Lauder Advanced Night Repair is my number one, favourite skincare product of all time so I couldn't wait to try these eye masks but they're quite pricey at £10/€14 for a single use product so I did actually wait for quite a while before buying it. I absolutely loved these masks - my eye area looked firm, plump, hydrated and more youthful. Expensive, but worth it. They would be perfect for busy mothers or those who suffer from sleep problems because they make the eye area look brighter. I haven't repurchased yet but will at some point! £10/€14. Masque Bar Anti-Wrinkle Sheet Mask: This mask was quite disappointing. The directions say to leave it on for 20-30 minutes but I found my skin felt tight and uncomfortable the longer it was left on and afterwards my skin felt quite dry, which is bizarre because the mask itself felt saturated when I applied it. I wouldn't repurchase. Overall, I think that sheet masks are a great quick fix for the skin but the only ones that I saw results with that lasted longer than immediately after use, are the Sarah Chapman and Estée Lauder ones and, unfortunately, they are the most expensive. I don't think sheet masks will ever replace traditional masks in my routine but for immediate, visible results or for convenience/holidays etc, they are perfect. I would love to hear what your favourite sheet masks are? Have you tried any of these? All products are bought by me, unless otherwise stated. The Pur-lisse mask was sent to me. Opinion is always my own.